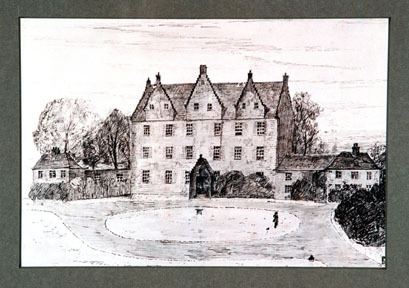 The picture above is a pencil drawing of the Kelsoland Manor. The picture and history of the door were provided by the Brisbane, Australia Mayors office. The original Kelsoland manor house was believed to be built between 1245 and 1400. The Kelso family lived in this home on the Kelsoland estate for approximately 300 years until it was sold to cousins named Brisbane in 1671. Some years earlier the Kelsos had lost their claims to nobility under Lord Archibald Kelso. Late in life, Archibald married his second wife, Catherine Ruthven. Catherine was the daughter of the Earl of Gowrie who had been executed for high treason in 1584 by King James VI. In 1600, King James was visiting Gowrie Castle and Catherines two brothers were murdered under mysterious circumstances. The Ruthven family blamed the King for their deaths, but the King claimed that he had merely foiled their attempt to murder him. In 1601, King James called a Parliament and it declared, "forfeit the lands and goods of all the Ruthven family". Since Archibald Kelso had married a Ruthven, he was stripped of his title, his lands, and his seat in parliament. A few months later Lord Archibald died as the last Kelso to be a member of titled Scottish nobility. In November 1601, by Royal Decree, the lands of the estate were restored to Lord Archibalds eldest son, David, but there is no written record of the name Kelso having borne a title or having a seat in parliament since that infamous day in 1601. Lord Archibald Kelso was the eighteenth and last of a continuous line of Scottish nobility which lasted for 543 years. Even though the Kelsos had lost their claim to nobility, they continued to be involved in the military and political life of Scotland and they continued to suffer the consequences. In 1644 civil war broke in England when the Puritans under Oliver Cromwell revolted against King Charles I. Scotland sent an army of 10,000 men to aid Cromwell. Major Robert Kelso was a member of that armys Cavalry, and was subsequently wounded in the battle of Marston Moor in July 1644. Oliver Cromwell died in 1658 and the British Crown was restored to King Charles II. The primacy of the Episcopal Church was re-established and the government began to punish all those who opposed the church and the Crown. Beginning in 1661, there were twenty-five years of brutal suppression of those who would not conform. According to written records in 1662 Robert of Kelsoland was fined 4,800 pounds and was subjected to other "ruinous fines for harboring persecuted Covenanters". Kelsos neighbor, William Gordon, was similarly fined and in 1666 his 2 sons were executed in Edinburgh. Fortunately, that same fate did not befall Roberts sons, John and William. It was 5 yaers later in 1671 that the Kelsoland Manor and estate was sold to the Brisbane family. The house then became known as the Brisbane house as it was known until its destruction in 1939. 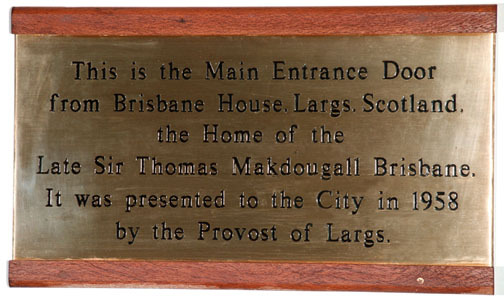 This wooden door, was given to the Brisbane City Council by the Provost of Largs, birthplace of Sir Thomas Makdougall Brisbane, after whom Brisbane Australia is named. It was formerly the main entrance door to Brisbane House, Sir Thomas' home at Largs; the house was demolished during the Second World War. 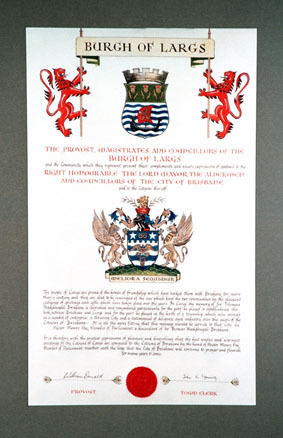 The door was brought to the Council's knowledge in 1958, when the Provost of Largs wrote to the Queensland Agent General in London informing him that it had recently come into the possession of the Burgh Surveyor. The Council subsequently advised its acceptance of the gift. This is the main entrance door of Brisbane House, Largs, Scotland, the home of the late Sir Thomas Makdougall Brisbane. It was presented in 1958 to the city by the Provost of Largs. Marker 1: Main entrance door to Brisbane House, Largs, Scotland. 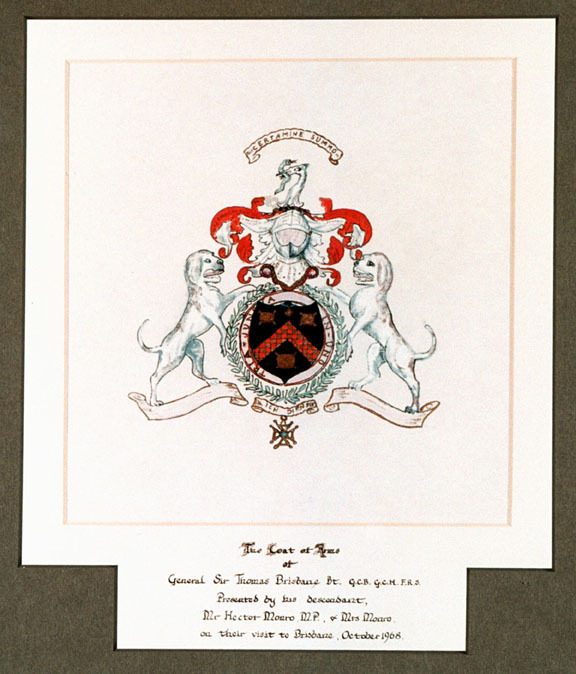 Marker 2: The Coat of Arms of General Sir Thomas Brisbane. 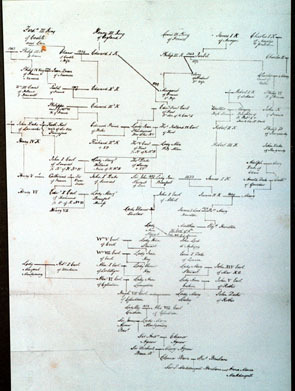 Marker 3: The Genealogy chart of the Makdougall family. Marker 4: A photograph of a pencil drawing of Brisbane House. Marker 5: A message of Goodwill from the City of Largs to the City of Brisbane. 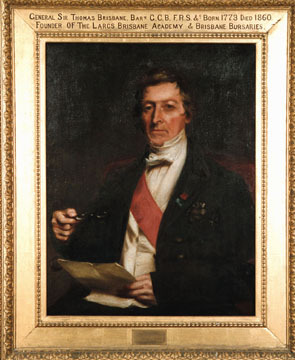 Marker 6: A portrait of General Sir Thomas Brisbane. Marker 7: The brass plaque detailing the origin of the door. 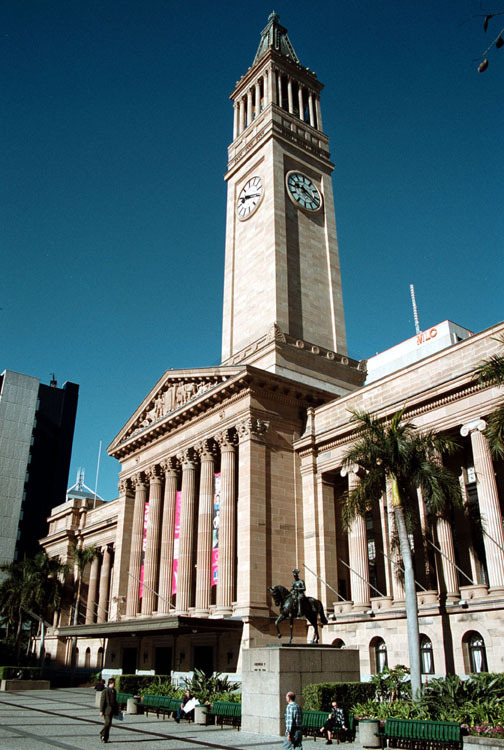 Marker 8: City Hall Brisbane where the door is housed.